This little xray fish is see-through! It would be adorable stitched onto a onesie, bib or a baby quilt. 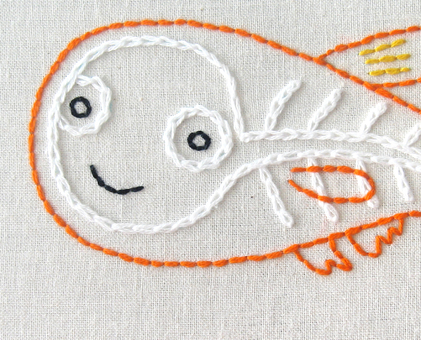 Stitch it without the bones and you'll have a cute goldfish. This pattern measures 4 inches x 3.75 inches (approximately 10cm x 9.5cm), but you can enlarge or shrink the pattern to whatever size you like.